Close to $9 billion was spent on digital video games globally in the first month of this year. That's according to the latest Superdata report, which claims worldwide digital spending across all platforms rose by 11 per cent year-on-year to $8.9 billion in January 2018. The sector that saw the biggest growth was console games, which saw digital revenues rise by 57 per cent year-on-year. This was attributed to the successful launch of Capcom's Monster Hunter: World, as well as ongoing sales for the biggest Q4 2017 hits. In fact, despite launching late in January, both Monster Hunter and Bandai Namco's Dragonball Fighter Z reportedly sold over 1.5m digital copies on console before the end of the month. This makes the latter the most successful fighting game launch - in terms of digital console sales - of all time. Premium PC sales grew by 24 per cent, while mobile grew by 11 per cent. Revenues from free-to-play MMOs remained relatively flat with just a one per cent lift, while two segments actually shrank: social games and pay-to-play MMOs, which saw revenues dip by five per cent and nine per cent respectively. Superdata notes that this marks ongoing decline for these sectors. 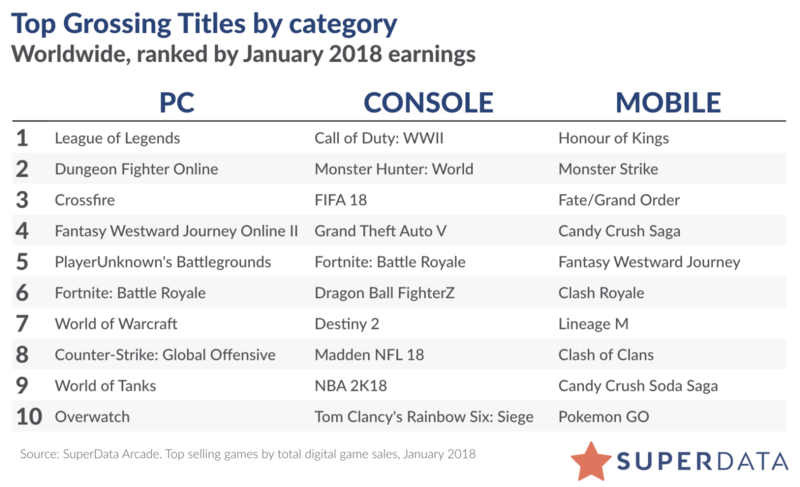 It will come as no surprise that two particularly strong performers were PlayerUnknown's Battlegrounds and Epic Games' rival Fortnite. Together, the two leading battle royale games generated over $200 million in digital revenues across console and PC. Superdata also shared the Top 10 bestselling digital games across PC, console and mobile, which you can view below.